Tokyo, January 6, 2011 — Casio Computer Co., Ltd., announced today that it has developed a watch equipped with Bluetooth® Low Energy Wireless Technology, a new technology for short-range communication. A prototype of the watch will be exhibited at Casio’s Booth at the International Consumer Electronics Show to be held at the Las Vegas Convention Center on January 6, 2011. Casio has been transforming the definition of the wristwatch for years by applying the latest technologies. Now, Casio’s prototype Bluetooth® Low Energy Watch is poised to create new possibilities for the way people use their watches yet again. Taking advantage of the low power consumption of the new Bluetooth® technology, the new watch powers Bluetooth® wireless communication functions with its single button-cell battery, the same kind used in small devices and watches. And it does this without losing any battery life compared to conventional wristwatches. This makes the new Bluetooth® Low Energy Watch highly useful because users can wear it everyday just like they expect of a wristwatch, without the bother of the recharging required by typical mobile devices. Casio’s new prototype can communicate with smart phones equipped with Bluetooth® Low Energy Wireless Technology, which will be available in the near future and be able to connect to networks of various kinds of devices. The new prototype demonstrates how Casio hopes to expand the ways people use their watches, unlike anything ever seen before, as new applications are developed for smart phones to enable communication between watches through smart phones. Accurate time information can be transmitted from a smart phone to the watch to ensure correct time The watch includes an alert signal to notify of incoming calls and e-mail messages sent to the user’s smart phone A smart phone’s ring alerts and vibration can be stopped by tapping the watch Alarm and vibration functions of a smart phone can be activated using a watch button. 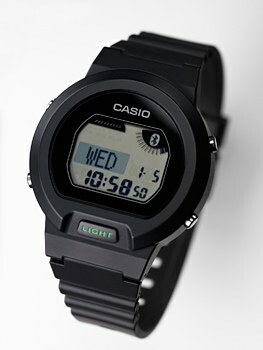 Casio aims to produce its first Bluetooth® Low Energy Watch in 2011. Meanwhile, Casio will call for partner companies to develop applications compatible with smart phones and other household devices in such areas as sports, health, home entertainment, security, and communication with family members and friends. Casio expects its new watches to offer people around the world a wide range of new lifestyle options. Casio’s demonstration of the Bluetooth® Low Energy Watch uses a prototype of a Bluetooth® Low Energy smart phone. The demonstration will be conducted at Casio’s Booth at 2011 International CES, in cooperation with NEC Casio Mobile Communications.